I have had hummingbird feeders in my garden here in southern California for 15 years or more. No matter the season, I keep the feeders full. 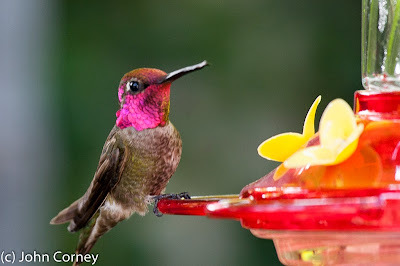 We have year-round residents which are the Anna's hummingbirds. In the spring, other varieties show up on their northward migrations, particularly the Allen's hummingbird. I don't know if it's the consistency with which I have maintained feeders in my garden or if there is something unique about this spring, but this year the number of Allen's hummingbirds is at a record level. No matter what variety, they all put on a spectacular show fighting over the feeders, darting about in dog fights and jockeying for ownership of the feeder. Currently I am filling the feeders at the rate of 1/2 liter or more a day! Think about how many dips of those small filaments of tongue it takes to get through that amount of "nectar"! The busiest time of the day to observe them at the feeders is first thing in the morning and between sunset and dark when they are busy tanking up on reserves before making it through the night. At that time their desperation to build up their energy reserves finally overcomes their competitiveness to fight off others at the feeder and you can observe multiple birds drinking from the same feeder at the same time. Hallelujah! Peace on earth! 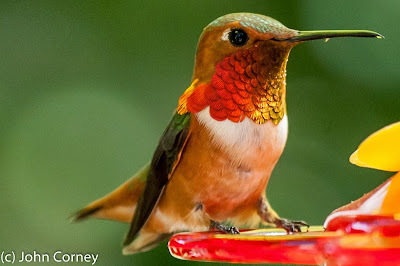 If you live in an area where there are hummingbirds and want to put out your own feeders, don't waste your money buying the expensive nectar you see at stores. Just buy a big bag of sugar and put a cup of sugar into a bowl and add 4 cups of water and mix till the sugar is dissolved. No need to add any gimmicky red food coloring. If you haven't had feeders in your garden or on your patio before, it may take a little while for the hummers to find your feeder, but stick with it and they will come. By the way, if you don't have enough birds to drink the nectar within 5 days, then throw away anything that is left over and replace it with fresh nectar. In the summer, clean the feeders with some bleach and rinse several times before refilling to avoid the growth of black bacteria. Anyhow, I took some photos today and captured some nice shots of both Anna's and Allen's hummingbirds. You can see the photos in my albums at my Facebook page: Allen's hummingbird photos and Anna's hummingbird photos. If you're really into these beautiful creatures, here's a video I took recently and uploaded to YouTube. 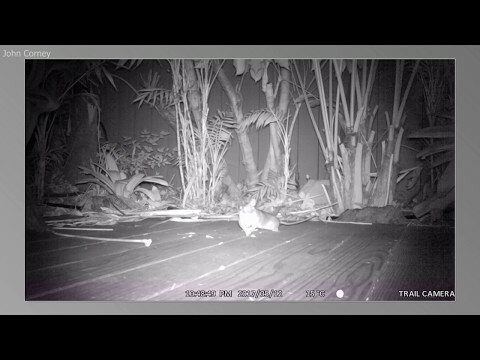 Video of hummingbirds at garden feeder. After years of hanging hummingbird feeders in my garden, these humble feeders are the favorite stopover for my birds. I'm not sure what it is, as it's not as bright and shiny as the others, but these are the favorite feeders by far. So if you are just getting started, these are my recommendation. Pick up a couple of these feeders from Amazon and get your own hummingbird haven up and humming.